It’s entirely possible that I have the thinnest and weakest hair out of any of you. I’m lucky that I have a lot of it but it’s weak and it’s thin and it’s feeling particularly dull this winter. I’ve been trying this new product – Bosley Healthy Hair Mousse in the shower each day to hopefully help revitalize my hair! It’s a Healthy Hair Strengthening Masque that uses biotin and vegetable proteins to strengthen and chamomile and jojba extract help to condition the hair. I’m noticing a difference! And it’s super easy to do because I can use it in the shower, let it sit for a few minutes and then wash it right back off. 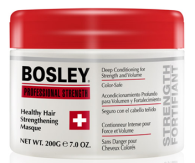 Get Bosley Healthy Hair Mousse on Amazon for $21.74. I, not you, win the prize for the weakest , thinnest hair.. and i don’t have much of it either! Yippee. So, your article intrigues me and I will certainly try Bosley! since I am always on the quest for miracle products to ,at the very least ,create the illusion that I have luxurious think tresses! thanks for the suggestion! That is a contest. I don’t want to win. Thanks for this review!